This has been a pretty strong year for horror films so far, for the most part. Sure, there’s dreck like The Bye Bye Man and Rings still being released, but already this year we’ve had well-received films of the genre like Split, Get Out, Annabelle: Creation and It all finding their own connections to audiences and turning them into major box office successes, not to mention strong critical praise. Hell, it’s been such a decent year for horror that even some of the less good horror movies (though again, not as bad as The Bye Bye Man) have been merely passable, from It Comes At Night to now The Ritual, which is a wholly decent and above-average spooky forest movie that starts off fairly strong, but quickly descends into something a bit sillier as it goes on. 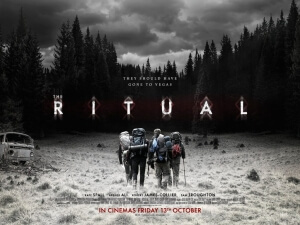 The Ritual follows four old friends from college, including Luke (Rafe Spall, the one recognisable name in the cast), Hutch (Robert James-Collier), Phil (Arsher Ali) and Dom (Sam Troughton), who are all on a hiking trip across the atmospheric hills of Sweden. They are there to honour the last wishes of their friend Robert (Paul Reid), who after suggesting that as their next international trip was unceremoniously killed during an off-license robbery, which Luke was also present for but hid instead of helping protect his friend. Nevertheless, the guilt-ridden Luke and his friends trek through the mountains, but then decide to cut through the surrounding woods when one of them suffers a knee injury – a bad idea, as it turns out, since they soon run into some disturbing sights that point to not only a pagan presence, but also that something much freakier is hot on their tail and keen to not let them leave. While the concept of people encountering disturbing things in the woods isn’t the most original, this one deserves a bit of credit for at least trying to work with some of the usual clichés and not necessarily reinventing them but giving them alternative ways of working. By and large, this isn’t really a horror movie that relies solely on jump-scares or fake-out dream sequences, and even when they do show up here they’re either for a purpose or directed well enough to leave a slight impression. It instead uses its eerie atmosphere to mine for chills more than anything else, and thankfully this movie is well-made enough with some fine cinematography and direction that it mostly works; it uses some good optical illusions and faraway shots to hint at something much scarier that’s coming for these people, and the night shots are mercifully well laid out that you can just about make out what is actually happening. It’s a well-made movie that uses its strong visuals to its own advantage, creating a spooky and chilling environment where necessary, and getting across the intended frights in just about the way it intends. The direction by David Bruckner is strong, the acting by the four main leads is solid, and the cinematography is quite top-notch, especially for this kind of horror film – all of these things are strong enough to carry at least the first two-thirds of this movie on their collective shoulders, but once it reaches the third act that’s when it starts to get a little too heavy even for them to carry. Without giving away much, the atmosphere is drastically altered from what we had previously seen, and suddenly we are introduced to a whole new obstacle that up until this point we hadn’t known much about; there had certainly been strong hints, but nothing to really give it much set up until it shows up. From there, the film becomes something a bit different from what it started out as, and that’s not necessarily a good thing, especially when what came before it honestly worked just as fine and didn’t need this drastic shift in focus. It also leads into the big reveal of what is actually out there in those big bad woods, and what it ends up being will surely be a major discussion point for audiences about whether or not it was a bit too much of a reveal; the best horror films of this type keep the major threat as much in the shadows as it possibly can, and once more and more is shown of them, the less intimidating they can become, which is sadly the case here too. Though it does come undone a bit in that third act, The Ritual still has enough technical prowess about it to pass as an above-average horror film, which again given that this year has mostly been pretty strong for the genre is a pretty noble achievement. The Ritual is a well-made but merely above-average horror film, with some strong technical strengths but a crippling third act that doesn’t suit the overall focus of what came before it.